Secret Sauce is Spoon University's online dashboard where members can manage their local chapters, publish content, receive analytics and access Skills training. Each new member must complete their position’s Skills training before unlocking access to the CMS portion of Secret Sauce. It’s the very first step to joining the Spoon community. Every year, Spoon HQ conducts an annual "revamp" of the Skills section. However, the process is often fraught with delays, miscommunication and heavy last-minute QA work from the project manager. More importantly, the content does not always successfully train students. In 2017, I led the Secret Sauce Skills revamp with two goals: improve the Skills content itself, and build a better revamp process that is timely, efficient and has everyone walking away proud of their work. Here I will discuss my project management process and how we ensured successful project delivery. I began by gathering a list of pain points from the last semester. I had plenty of personal experience to draw from, as I assisted project managing and executing the Skills in the final month of the summer 2016 revamp. I also conducted a series of interviews with my teammates to understand their perspectives. I combined my pain points research into a problem-goal-tactic matrix to clarify the path moving forward. I categorized all of the pain points into three sections: Operations, Content and System. The PM created all of the outlines, shutting out content creators from the process. The PM only had 10 days to outline for up to 400 pages of content. Committee members only had 1 week to create first drafts, which consisted of 40+ pages of content. The waterfall schedule made editing a behemoth effort each time. The schedule separated the text and multimedia. I knew from my experience with the previous year's revamp that a lack of pre-work created an inconsistent quality of deliverables and miscommunication. One of my major responsibilities was properly scoping the project and empowering my team to strategize their work. In order to get an accurate project timeline, we mapped out each needed milestone by several key factors: stakeholder, due date, task, hours necessary and deliverables. This roadmap became a Google calendar shared with the entire committee. Previously, we did not have clear goals defined for the Skills training. To help the committee understand the end users' behaviors, abilities and objectives, we created user archetypes for each Position. 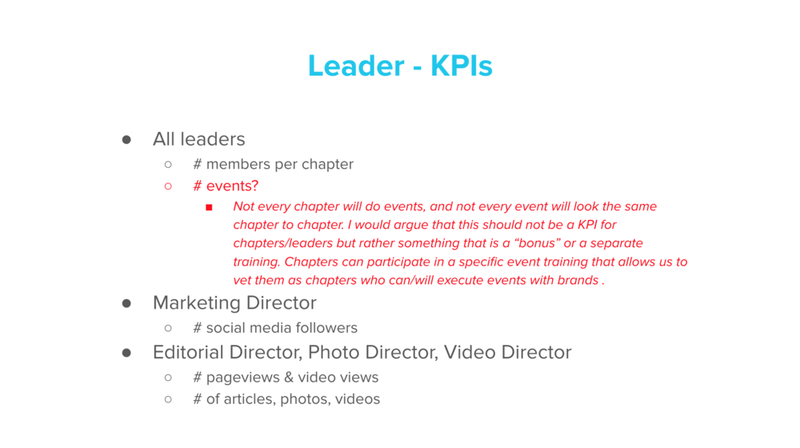 Defining the KPIs gave us a higher level look into what success for Skills training meant. During the last revamp, outlines changed so much that it created a lack of confidence in the process. This time, we designed a very intentional outline process to solve for previous issues. First, brainstorm an ideal outline. Second, audit existing content by Needed Objectives & Outcomes, Page Type, Fundamental-ness, Current Success. Third, bridge the two exercises into a final outline and review with department managers. The biggest issue with content creation was the structure of our work flow. We changed the structure to include frequent, smaller writing and edit sprints. This was more realistic in terms of time required to get the job done, and much more manageable in workload. All 6 Skills per Position half-heartedly created in Sprint 1 due to shortage of time. Started a domino effect. Separated multimedia and text deliverables. Create a second draft before moving onto next Skill. Multimedia is incorporated into second draft. 3 Skills = 1 wave. This was an extra layer of preemptive editing to save time later. To create a consistent voice, style and flow, I built a voice and style guide, glossary and page templates that illustrated what the content should look and feel like. This established rules around length, tone of voice and general rules of thumb that also helped me during edits.